Tabled for now, but not for long. about when I can't be home for the holidays. Ginnie Hart: Yes, Robin. It was our first time together and only an hour's drive away. We've already promised we'll go back at least once a year...if for anything, mussels for Astrid! I know you're enjoying your time in Argentina! Wouldn't want 'em to get wet if it floods, heh! You have a great eye for the unusual, Ginnie. Ginnie Hart: As I recall, Ray, there was an overhang over them so they didn't even get wet in the rain! Thank you. You're very kind. Ginnie Hart: Thank you, Cherry. I actually think they were for sale but I have never seen them put on tables like that before! Just waiting for a rider! I'll look forward to reading your V&V piece tomorrow! Ginnie Hart: I think also just waiting for a buyer, Elizabeth? Astrid says they were for sale. Thanks. Ginnie Hart: Just raring to go, Peter! Thanks. A great shot and I wonder if they will be sold one day. It was wonderful to be in Antwerp, also 'by night'. Ginnie Hart: I still wonder why they were up on tables?! But I'm sure there was a reason. We had a great photo hunt in Antwerp and will do it again...especially for the mussels! Bedankt, MLMA. Have they fallen out Ginnie??? Ginnie Hart: One just never knows about such things, Sally. That is a very clever parking spot. This person would do excellently in London where parking is like gold dust. Fine capture! 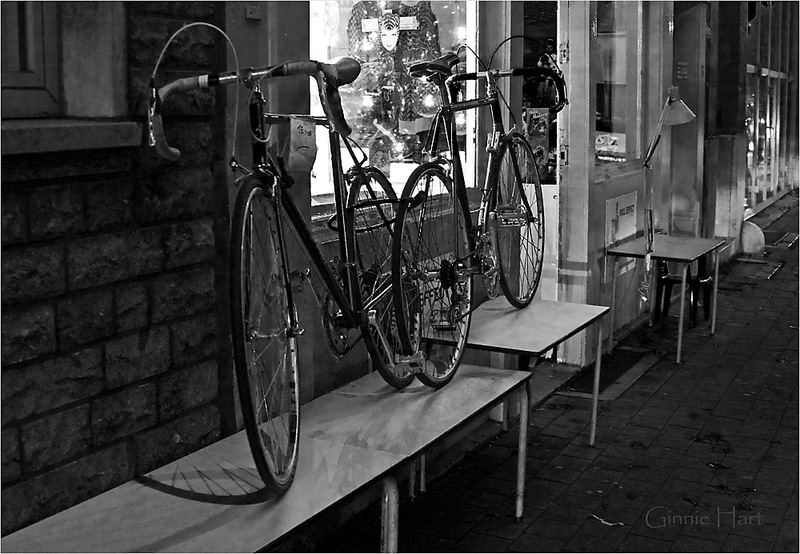 Ginnie Hart: This was a first for me, SAVO, to see bikes standing outside on tables. Astrid says they were for sale. Hmmm. Thanks. Ginnie Hart: So, I Googled oil pulling and just spent the last 15 minutes reading all about it. Hmmmm. That might be worth trying! I'll let you know. In the meantime, so glad you're feeling better! Thanks. Ginnie Hart: HA! So glad I'm fairly predictable, Lisl. Thanks. Ginnie Hart: Back to back they face each other. HA! In the street Ginnie? I hope they were tethered! Ginnie Hart: Yes, Chris, on the sidewalk next to the street along the shops. You can see the lock tying the two back wheels together. That was pretty smart! Haha- fashionable bikes - for you and Astrid? I am not sure if I would dare to go by bike through busy Antwerp - but a wonderful town and I'm looking forward to your photos! Ginnie Hart: There were bikes to rent, Philine, but we did just fine walking. It was a great visit...and by only an hour's drive from us, something we promised ourselves to do at least once a year...especially for the mussels for Astrid! Bedankt. Ginnie Hart: Astrid says these were for sale, so who knows why they were on higher ground! Maybe to be at eye level? Thanks. hehe I knew how important bykes are in the Netherlands, but I see it is getting out of hand, Ginnie! Ginnie Hart: HA! Well at least these were in Belgium, Juan Carlos, so I can just smile. Ginnie Hart: Thanks, Bill. One just never knows about these things! So I was right about the slate! We're they expecting floods at the time Ginnie? Ginnie Hart: We did have some rain during our two days, Chad, but not that much, no. Who knows! Interesting scene and site. Can't wait to see/hear more about Antwerp! Ginnie Hart: Thank you, Marcie. I thought of you a LOT on the Sabbath as we walked through the Jewish neighborhood...and were surrounded by families walking home after synagogue late morning! I'll never forget it (lots of Polish Jews with their fabulous hats). Ginnie Hart: Thanks, Vintage. I have no clue either! A wonderful b&w Ginnie.Looks like they are ready to go ! Beautifully seen and captured. Ginnie Hart: Thanks, Laurette. Astrid says they were for sale. Hmmmm. Ginnie Hart: Thanks, Anee. I know...that lamp caught my eye as well. Haha, seems like a sensible solution for keeping the bikes dry and from taking up space on the sidewalk, Ginnie. Also, all the better to examine them at eye level if you are interested in buying. Like how you've captured that cute smiling face in the window. Ginnie Hart: I'm sure the whole thing made sense to someone, Beverly! And yes, it was fun to see that face smiling back at me once I saw it on the big screen. Thank you. A very fine shot Ginnie! I like the sparkly lighting and the wheel shadows, great in B&W! A great, if rather strange find. Ginnie Hart: we're lucky to see the strang things everywhere, Brian, aren't we! Did you ever ride a racing bike? Ginnie Hart: Art for sale! Makes sense, Wim. But NO, I've never ridden a racing bike but Astrid has one that she rides from time to time. She's in heaven when she does it. Helmet and all. The sign on the nearer bike seems to say it is for sale. The 2 bikes seem to have tied the knot. Ginnie Hart: Astrid says they are indeed for sale, Louis, but why they're on the tables is beyond me. I do like how they're locked together, end to end. Ginnie Hart: Oh how fun, Tom. Thanks for the link. We'll keep that in mind for our next trip. And yes, "Back to back they faced each other!" I think I've said this before, but I really admire how you take the 'ordinary' and turn it into scene worthy of admiring. Ginnie Hart: Every time you say that, Sue, you make my day! Thank you kindly. Were the owners expecting a flood to come Ginnie? Nice and original capture! Ginnie Hart: I have no clue whatsoever, Richard. It still leaves me scratching my head! Merci. A fine BW capture Ginnie! Ginnie Hart: It does make you wonder, Sarah, doesn't it! Astrid says they were for sale, so I guess that explains it? Thanks. The bikes' motion is tabled! Ginnie Hart: Truth is always stranger than fiction, Oscar, isn't it! Gracias. Seems like an excessively elaborate way to park one's bike. Ginnie Hart: If they're for sale, as Astrid says, then maybe it makes more sense? Who knows! Waiting to be served up to waiting bikers. Ginnie Hart: I think so, Michael. Waiting for the highest bidder. I like the shadows of the tire on the bicycle closest to the foreground! Ginnie Hart: Thank you, Helen. I liked that shadow, too. Looks like they are expecting floods. We are rather obsessed with such things at the moment. Ginnie Hart: Yes, Janet, I have seen and heard about all your rain. We did have some rain while in Antwerp but it wasn't anywhere close to flood stage, thankfully. I do wish you a dry spell soon! Ginnie Hart: I do like to do B&W every once in awhile, Angevine. Change things up a bit, you know. Merci. nice catch.. hmm.. these are on sale, no? Ginnie Hart: Yes, Rian. Bikes for sale!